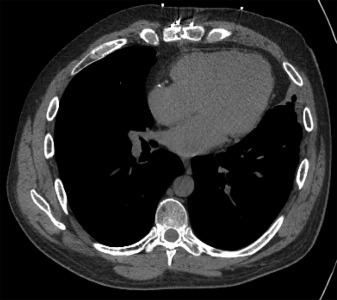 After a motor vehicle crash, a 45-year-old man presented to a freestanding emergency department, where he received CT imaging. On administration of intravenous contrast, the patient experienced muscle spasms, coughing, and chest tightness. These symptoms spontaneously resolved within 30 minutes. The chest CT demonstrated a 300-mL air embolism in the right ventricle of the heart. The patient was transferred to a quaternary care emergency center, where he was positioned in the left lateral decubitus position, was monitored with telemetry, and began receiving oxygen therapy. 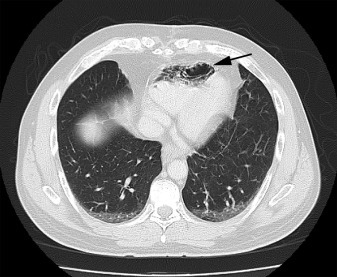 Repeated CT imaging was obtained at approximately 12 hours postiatrogenic injury, which revealed that the embolism had spontaneously resolved. The patient was monitored for 24 hours and discharged home without any obvious immediate sequelae. - Patient presentations of venous air embolism range from asymptomatic to neurologic deficits, chest pain, dyspnea, headache, and confusion, with the symptoms in part dependent on whether the embolism is in the right or left side of the heart. - Cardiac arrest and respiratory collapse can also be the initial presentation of air embolism, which makes this diagnosis difficult. - The lethal dose is estimated to be 300 to 500 mL, rendering the outcome of the patient in this case remarkable. - The treatment of air emboli is largely supportive, including positioning the patient in the left lateral decubitus position and providing supplemental oxygen.